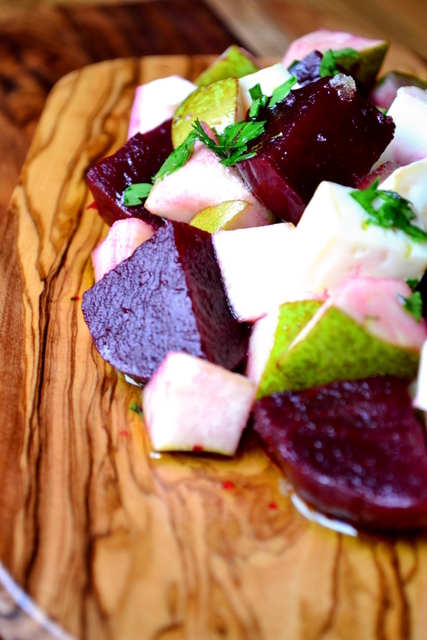 Drizzled with local honey and extra virgin olive oil, this recipe for Beetroot, Pear and Goats Cheese Salad brings an interesting and complementary range of flavours to the dinner table. Served in large chunks, it’s a salad perfect for sharing with others as a starter, or even main meal. Most salad recipes – even potato salads – offer something uniform; you’re presented a dish and, though delicious, each mouthful taken contains more-or-less the same components. Arrange things in large chunks however, and you get the sense of being able to pick and choose the flavours you enjoy in every mouthful. In terms of flavours combining earthy beetroot, sweet pear and a pungent goats cheese provides a wonderful contrast of sensation. Just make sure the pears you use are perfectly ripe. There’s nothing worse than a firm pear that hasn’t been allowed to develop its natural sugars. Getting that right is the difference between salad failure and sublime success. 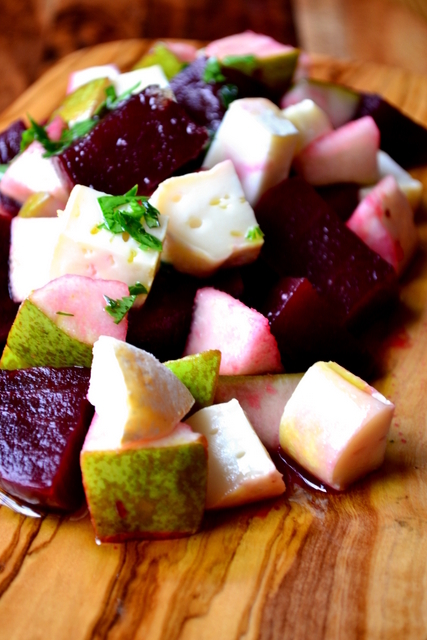 Chop your beetroot, pear and goats cheese into chunks of around 2cm. Arrange on a plate, serving platter or chopping board. Drizzle with honey, before adding a few drops of extra virgin olive oil. Finally, finish with parsley and a sprinkling of salt and pepper. Serve with a freshly baked loaf of bread. Cost: Depending on your taste in goats cheese this salad shouldn’t set you back very much at all. A good, farmhouse goats cheese will be rather expensive, but you can pick up a decent round for a very reasonable price indeed. 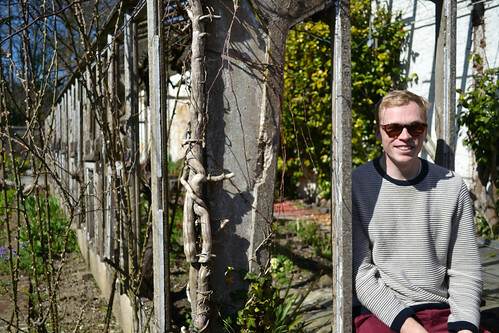 The salad photographed set us back around £3, but you could serve it up for cheaper. I love Goats cheese, so this looks fab 🙂 have a good weekend! Thank you – it was really delicious. I love your salad ingredients and shall copy . . . but, to each their own: altho’ I understand why you are using larger chunks my preference would be about half the size . . . I can still pick out the different components, but my ‘eye for beauty’ would deem the dish ‘prettier’ 🙂 ! 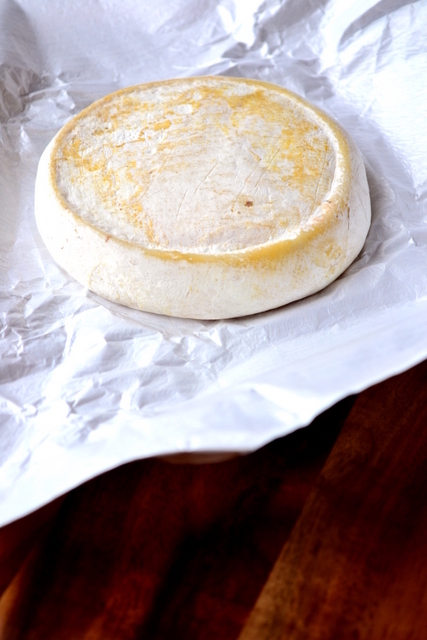 You should have tasted my goats cheese, all the way from France. Powerful stuff. Yes, please! 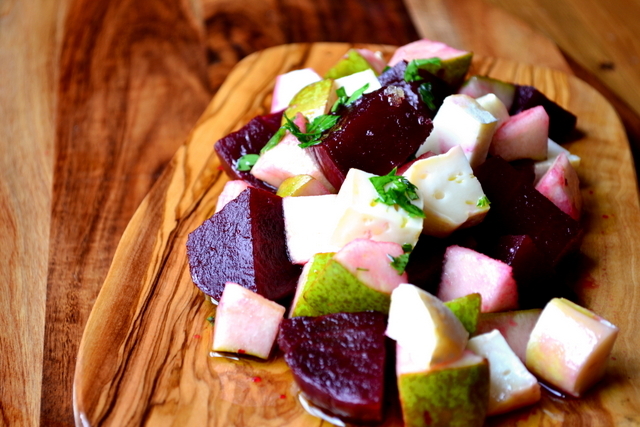 I love pairing beets with goat cheese and a fruit (I often do oranges, as in this: https://taplatt.wordpress.com/2013/05/31/recipe-roasted-beets-with-oranges-goat-cheese-balsamic-glaze/). I’ll definitely try pears, which I love in the summertime. Yes! They just seem to work effortlessly.You won’t regret it. Your salads have been so inspiring! This one looks delightful.